Chris Hawkes of Rads End very kindly has leant these heirlooms for publication. 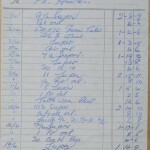 They are receipts kept on file by his father from the 1960s. You can click the images above for bigger versions, or click here to go to a Picasa web album of the images. 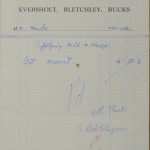 The first three images are receipts about cars and motoring. 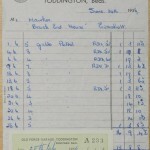 An “Austin Seven Saloon” (that is, a mini) was bought new in 1962 for £567, including purchase tax. 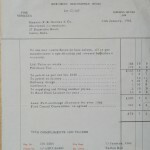 Road tax was £15 per year. A pair of number plates, supplied and fitted, cost £2.50. A T C White ran the Ridgmont Garage, the one that’s just closed in 2011 now that Ridgmont has its bypass. 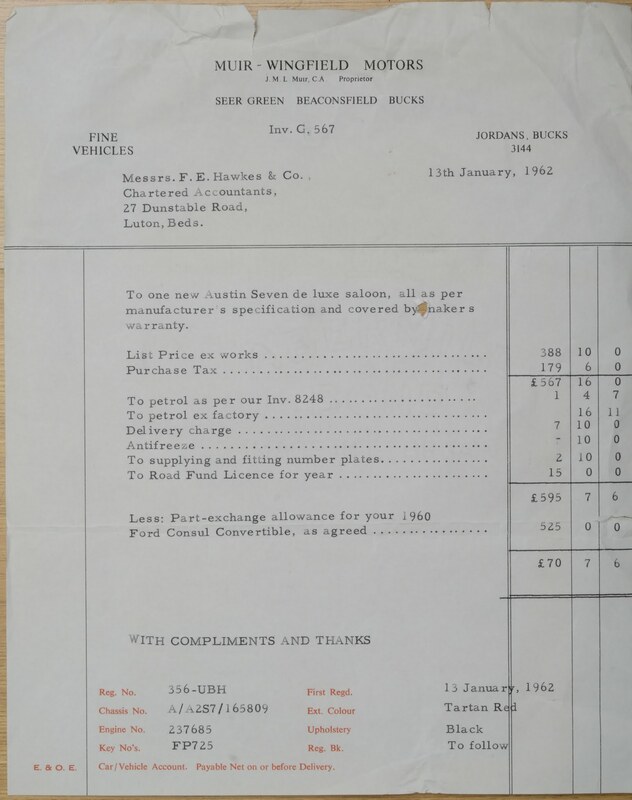 In 1964, petrol was £0.056 per litre. That was back when it was full of lead. What a strange idea, putting lead in petrol that was sprayed all over the countryside! 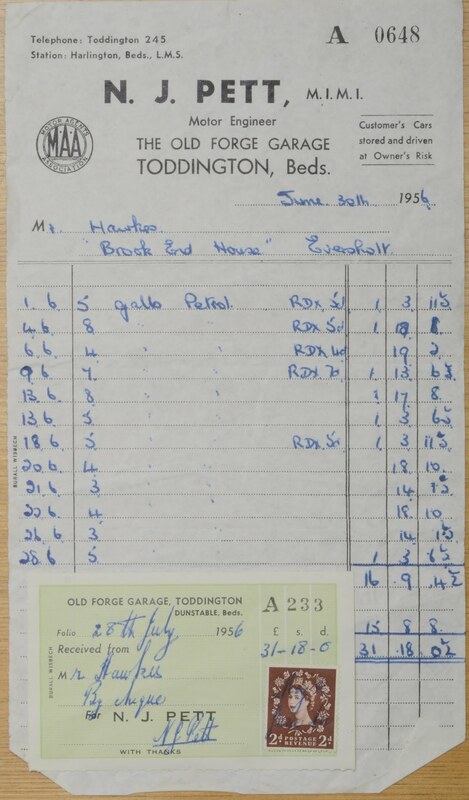 Engine oil was £0.20 per litre, and they really used a lot of it back then – there are 13 pints, 7 litres, of oil on the bill for the month. Where did they put it all? And a inner tube for a tyre, another idea that isn’t routine now. H Anstee ran the Green Man. 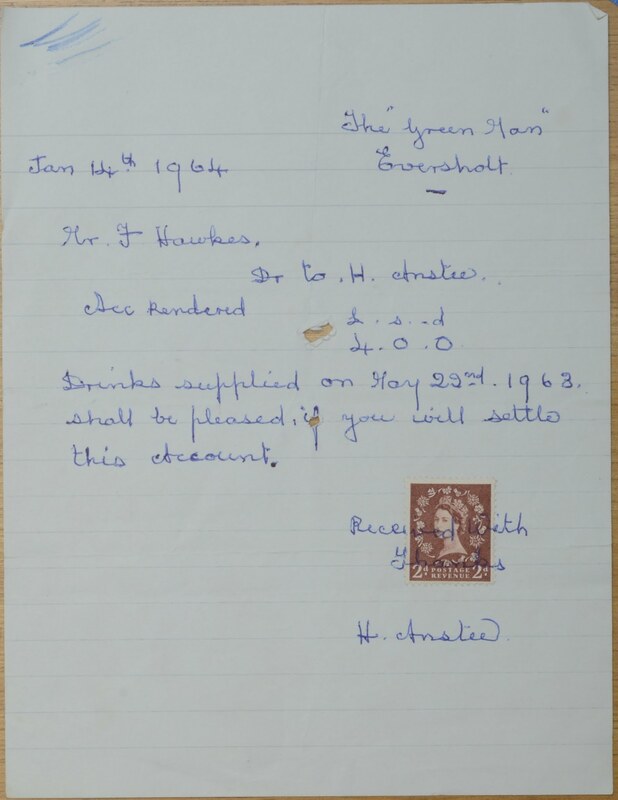 Mr J Hawkes ran up a bill of £4.00 there on 22 May 1963, the bill was settled on 14 January 1964! 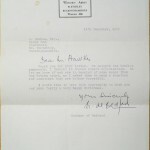 “Received with Thanks”, indeed! 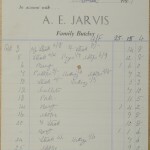 A E Jarvis was the butcher. 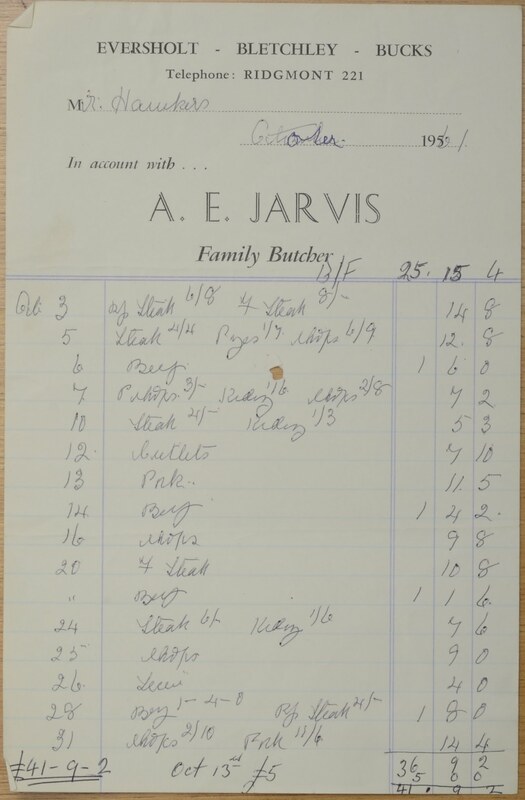 October 1956 saw the Hawkes household billed £16 for beef and pork – presumably lamb was out of season in October. 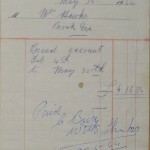 Arrears made the whole bill add up to over £41, a small fortune! 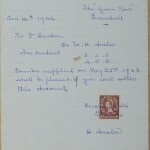 S Fleet-Chapman supplied milk and newspapers. 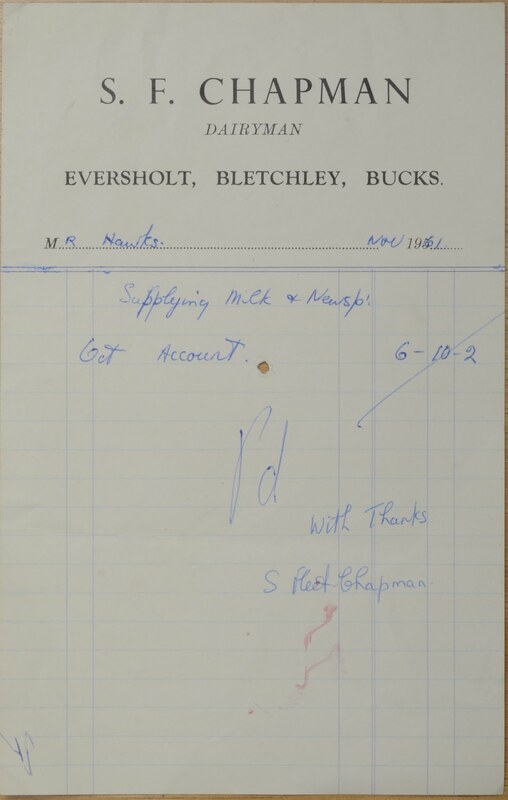 The Hawkes bill for October 1961 was £6.51. Cecil Brett was the baker. 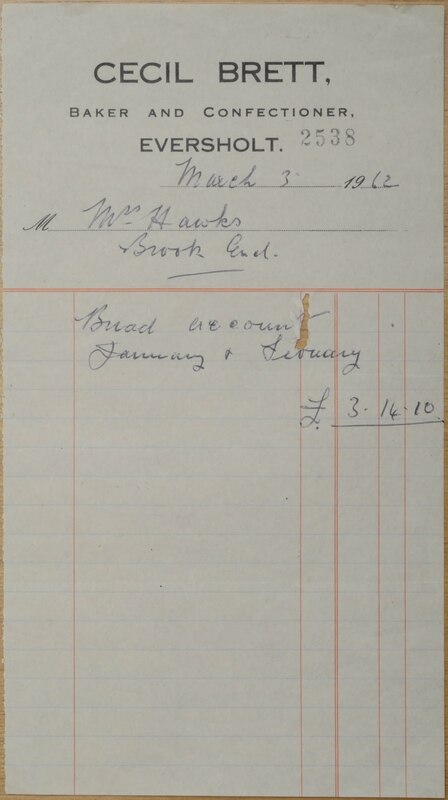 Bread for January and February 1962 cost £3.70. In 1964, the bill was ignored for 4 months at a time. 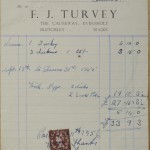 F J Turvey was in business at “The Causeway”, Eversholt. That’s the strange name of the house in Witts End – strange because there’s no sign of a causeway for miles. 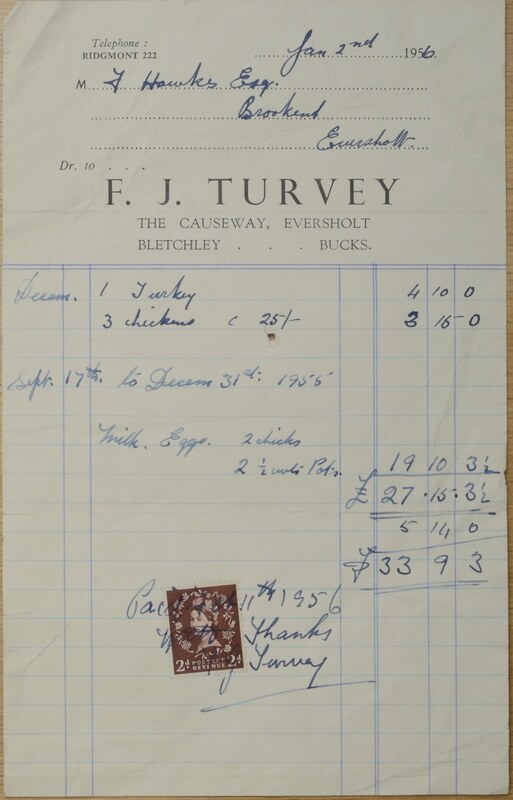 In December 1956, a turkey cost £4.50. Chickens were £1.25 each. 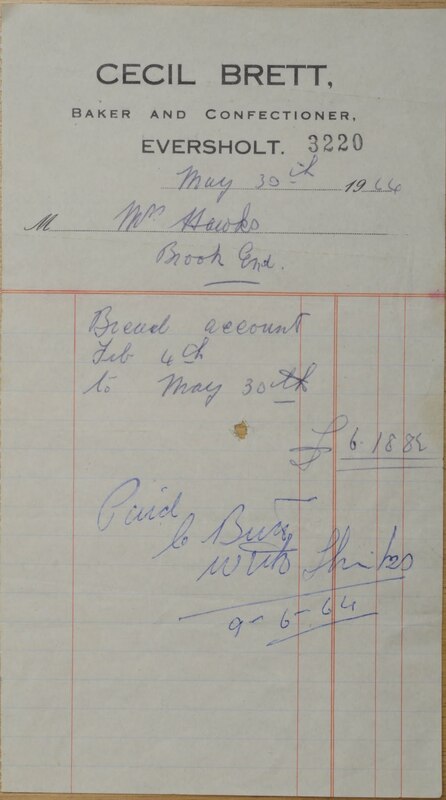 Milk, eggs, 2 chickens and 127kg of potatoes cost £19.52. 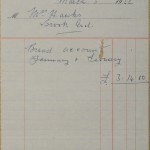 The bill started in September and wasn’t paid until the next February! The last image in the collection is a bit out of place. 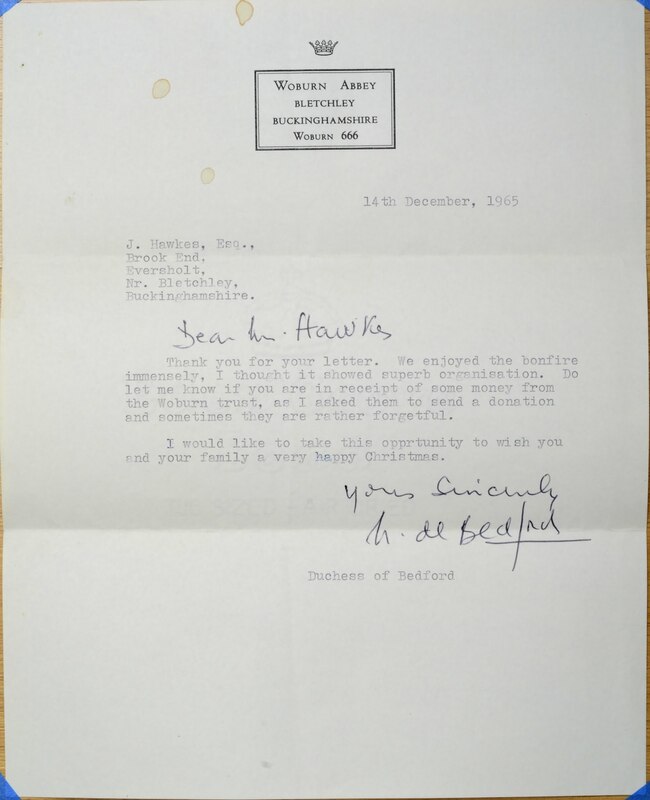 It’s a pleasant note to Chris Hawkes’s father from the Duchess of Bedford in 1965, thanking him for the fine firework display. The Eversholt bonfire night, organised by the Hawkes family, was renowned far and wide in those days. The Duchess then was presumably Nicole Milinaire. Number plates 2.5 45 107 30? 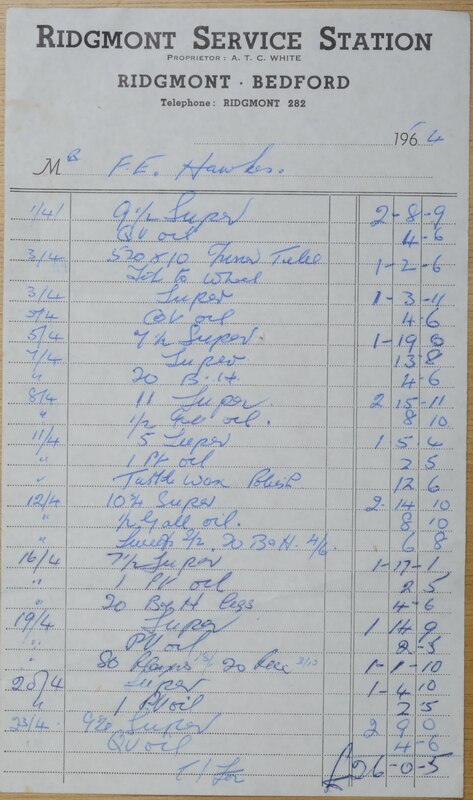 So, according to these numbers, nearly everything we buy is much more affordable nowadays than it was in 1960. A mini today is a dramatically better car than a mini in 1960 was, too. Even petrol after all those price shocks, isn’t much dearer. Be thankful!